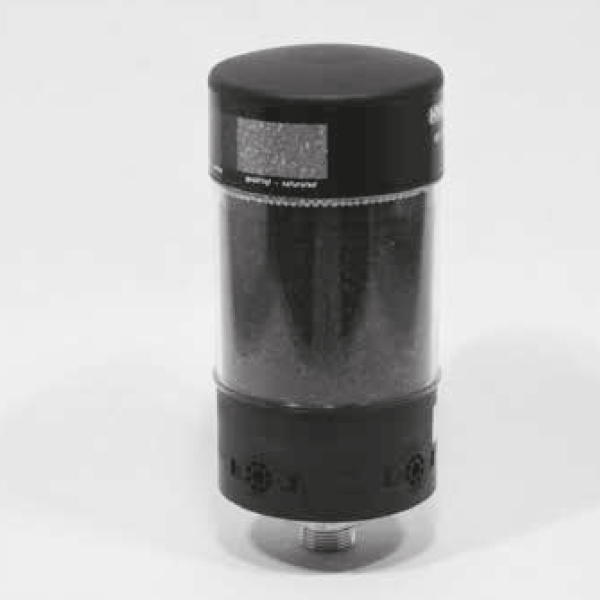 The HYDAC Desiccant Breather BDE filter is a breather dryer filter. In hydraulic and lubrication systems, water ingress into the tank is a familiar problem. System operators constantly face a high breakdown and maintenance costs that are traceable back to water in the system. This is because of water, even in its dissolved state, causes accelerated degradation of the additive components by hydrolysis. Therefore, these reactions cause the oil to lose its desired characteristics and then, it will age more rapidly. The depletion of the additives also leads to increased oxidation in the base fluid. What’s more, water also has serious and adverse effects on the operating system components, damaging them by corrosion and hydrogen embrittlement. The distinctive feature of the desiccant breather dryers BDE is that it has two separate chambers. These chambers are possibly fillable with two desiccants, which in combination increase total water retention (two-stage dewatering). As an option, and as a special protection of the desiccant, four valves are built into the bottom of the unit. So then, during system shutdown, it will avoid saturation of the desiccants. A check valve is available as an option to prevent exhaust air from the tank/ transmission from flowing back through the desiccant. This means that there is a protection of the desiccant from oil mist and there is no re-drying of the exiting air. The built-in pleated air filter element (absolute filtration of particles > 2 µm) provides the filter with a very high contamination retention capacity (26g). In order to ensure reliable function, replacement of the entire cartridge is necessary. When the change of the filter is due, the colour changes from dark red to light orange.